I've never been skiing/snowboarding before. Will I be able to learn? Absolutely! Skiing is not just a sport for pros. Remember: everyone was a beginner at one time! Ski Cooper’s legendary Ski School can provide you with top quality ski and snowboard instruction tailored to your age and abilities to get you on your way to a lifelong enjoyment of winter sports. Ski Cooper is the ideal mountain to learn to ski or ride. We have a huge beginner area with the state’s longest Magic Carpet conveyor lift; it’s just like riding a people mover at the airport… just step or ski on, and let the conveyor do all the work for you! As you improve, we have a perfect terrain progression for you, with ample wide-open “green circle” (easier) runs, moving up to smooth “blue square” (intermediate) cruisers, and finally all the way to steep “black diamonds” (advanced) with powder, glades, and moguls to keep you interested and challenged. Which ski lesson should I choose? This information will help you pick the most appropriate lesson for YOU! What Kind of Lesson Is For Me? Lessons are sold as either a GROUP LESSON, a GROUP PACKAGE or a PRIVATE LESSON. Group Lessons and Group Packages may have up to (9) people in the group. PRIVATE LESSON: Private lessons are the best way to learn! You receive the instructor’s full one-on-one attention. A private lesson would be just you, or make it a semi-private with anyone else you wanted with you up to (4) people total at the same ability level. GROUP LESSON: In a group lesson, you and up to (8) others will learn skiing or snowboarding skills. Group lessons are available in 2-hour blocks. When you purchase a GROUP LESSON, you purchase just the LESSON. Equipment rental and lift tickets are additional. FIRST-TIMER GROUP LESSON: These lessons, available in 2-hour or 4-hour blocks, are for people brand new to snowsports, and will get you started skiing or snowboarding. GROUP PACKAGE: When you purchase a GROUP PACKAGE, the Lesson, Lift Tickets and Rentals are included. I've never ridden a chairlift before. What do I do? Well, it’s not really as hard as you’d think. But if you’re unsure, it’s always best to ask the lift attendant for instructions. The basic procedure is quite simple. After getting your ticket scanned in the lift queue, you will eventually make it to the “Wait Board” (a plastic, colored board in the snow). Wait here until the lift attendant tells you to go (or until the chair for the riders in front of you has passed you) and then ski up to the “Load Board.” Keep your poles in the inside hand (that is, your left hand if you are on the right side of the chair, or your right hand if you are on the left side of the chair). Then, look over your outside shoulder and watch the chair as it comes toward you. The lift attendant will “bump” the chair to make a nice smooth load. As you feel the chair touch your leg, just sit down. Now enjoy the ride! For added comfort , pull down the foot rest. Remember to raise the foot rest again before you reach the unload area (there will be a sign on a lift tower telling you to prepare to unload). When you reach the unload point, stand up and ski down the ramp. Be sure to move away from the unloading area as quickly as you are able to keep that area clear for the skiers behind you to unload. Ski. Repeat. I haven't been skiing/riding in YEARS! What do you recommend? We would strongly encourage you to take a lesson with our Ski & Ride School to refresh your skills and knowledge about this fantastic sport. A lot of the motions come back pretty easily, but it’s not quite like “riding a bike.” Remember that skiing can pose risks and hazards, and taking a lesson is the best way to ensure that you will make a fun and safe return to the sport. I don't have my own skis/boots/poles/snowboard. Can I still go skiing/riding? Of course! Our fully-stocked ski/snowboard Rental Shop has all the gear you need to enjoy a fun and affordable day on the mountain. We will gladly rent you alpine or telemark skis or a snowboard, boots, poles, and even a helmet to keep the ol’ noggin safe! The alpine environment is beautiful and fun, but can be harsh in the winter months when we are operating. Your base layer should be moisture wicking, preferably synthetic or wool (cotton is not sufficient; it holds your sweat in and causes you to get cold very quickly!). Then layer appropriately for the temperature. The colder it will be, the more layers you want (except socks… usually, layering socks only makes you colder, so stick with a single, good pair of synthetic or wool socks). As for outerwear, you will need a waterproof winter coat, waterproof snow pants, a winter hat* which completely covers your head and ears, ski goggles to protect your eyes, waterproof winter/ski gloves, and moisture wicking ski socks (not cotton, but wool or synthetic). If it is especially cold, you will want a neck gaiter to keep the cold air off of your neck and chin, and out of your coat. You might also consider a pair of glove liners, which is just a super-thin pair of gloves which go under your ski gloves to keep your hands extra warm. *A hat is the bare minimum, but a ski helmet is strongly encouraged. Ski helmets help to keep you warm, and they greatly reduce risk of head injury in a fall. You can buy ski helmets in our Snowflakes Retail Shop, or just rent them for your ski trip from our Rental Shop. I don't have appropriate hats/gloves/goggles/ski pants/etc. Do I need to buy these before coming to Cooper? No! The Snowflakes Retail Shop located in our Rental Shop has all the winter gear you need. You’ll find the latest winter outdoor fashions, and plenty of extra-warm gear for ski weather. You can also buy sunglasses, sunscreen, souvenirs, and much more. What if I get hurt or need help while I'm at Cooper? We certainly hope that you will have a safe and trouble free ski trip. But like all sports and physical activities, accidents can and do happen sometimes. But not to worry: Ski Cooper’s Ski Patrol is here, ready, willing, and able to help. Our Patrollers are either Colorado EMT certified, or certified in Outdoor Emergency Care, which is regulated by the National Ski Patrol. These certified Patrollers are available to provide emergency response, first aid, and any other general help you may need. Please also check out our Snowsports Safety page to learn about how your responsibilities on the mountain. Inside the lowest level of the Base Lodge you will find our Guest Services desk. The friendly face behind the desk is there to provide information and assistance to you, our guest. 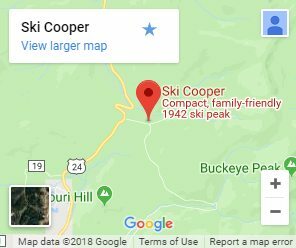 For your service and convenience, Ski Cooper also has a corps of volunteer Ambassadors (in the base area and on the mountain) who are ready to provide any information you may need, to answer your questions, and to point you in the right direction. You can also feel free to ask any of our friendly staff members for assistance. What do all of the signs and symbols mean around the mountain, and in your trail map? Learning about the signage commonly used to designate ski trails is important for your safety and enjoyment. To get acquainted with ski area signage, check out our Snowsports Safety page. Where do you store your moguls in the summer? I’m afraid that’s a trade secret which we are unprepared to share at this time.